Counterfeit and pirated products come from many economies, with China appearing as the single largest producing market. These illegal products are frequently found in a range of industries, from luxury items (e.g. fashion apparel or deluxe watches), via intermediary products (such as machines, spare parts or chemicals) to consumer goods that have an impact on personal health and safety (such as pharmaceuticals, food and drink, medical equipment, or toys). This report assess the quantitative value, scope and trends of this illegal trade. Piotr Stryszowski, Senior Economist at the OECD and specialist in Counterfeit Trade, talks about the impacts of counterfeit trade on the global economy and the steps being taken to crack down on a USD 450 billion industry (Duration: 16 minutes). Imports of counterfeit and pirated goods are worth nearly half a trillion dollars a year, or around 2.5% of global imports. The total value of imported fake goods worldwide was USD 461 billion in 2013 (total imports in world trade of USD 17.9 trillion). Up to 5% of goods imported into the European Union are fakes. US, Italian and French brands the hardest hit. In many cases, the proceeds of counterfeit trade go towards organised crime. Most fake goods originate in middle income or emerging countries, with China the top producer. Postal parcels are the top method of shipping bogus goods, accounting for 62% of seizures over 2011-13. 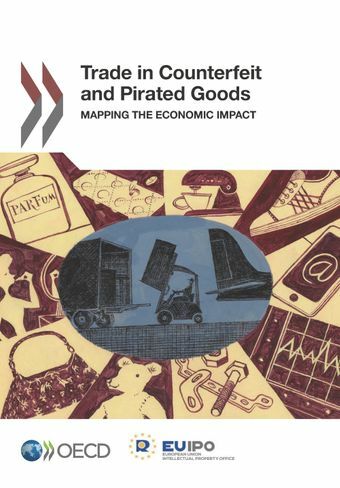 This report covers all physical counterfeit goods, which infringe trademarks, design rights or patents, and tangible pirated products, which breach copyright. The report does not cover online piracy, which is a further drain on the formal economy. WHAT ARE THE HEALTH/ SAFETY IMPILCATIONS? Counterfeit goods can endanger lives – auto parts that fail, pharmaceuticals that make people sick, toys that harm children, baby formula that provides no nourishment and medical instruments that deliver false readings. WHAT TYPE OF GOODS ARE HIT? Fake products crop up in everything from handbags and perfumes to machine parts and chemicals. Footwear is the most-copied item though trademarks are infringed even on strawberries and bananas.